Designing and delivering a training to a nonprofit audience is not about extreme content delivery or putting together a PowerPoint and answering questions. If you want to get results, you need to think about instructional design and learning theory. And, there is no shortage of learning theories and research. As someone who has been designing and delivering training for nonprofits over the past twenty years, the most exciting part is apply theory to your practice. I use a simple structure to design: before, during, and after. This framework works like a charm, whether it is a one-hour webinar or 7 day intensive International training or college graduate course or year long peer learning program. Recently, I was on a call with colleagues to plan our NTC session on training, and co-presenter Cindy Leonard said to me, “You are using ADDIE!” ADDIE is an instructional design method that stands for Analysis, Design, Development, Implementation, and Evaluation. For the networked nonprofit workshops I facilitate, I’ve developed a maturity of practice assessment called “Crawl, Walk, Run, Fly” which gives me a detailed understanding of where the organization is in its practice. As I’ve expanded my repertoire to train people on other topics (not just social media or measurement), I have learned how to create practice rubrics for other areas. It takes several iterations of your survey to develop one that works, but you really gain a good understanding of the level of your audience. Sometimes you don’t have the ability to do a survey before, especially if it is an online webinar or a conference session. There are alternative ways to do research. I obtain a list of participants with their organizational contact information and do a scan and audit of their digital presences if I’m leading a session on digital marketing. I might audit their Facebook best practices and other social media channels. In addition, I do a little real-time assessment in the room by doing “raise your hand” polls or in a webinar by using the polling feature. This can help you adjust in real-time to the audience needs or what I call a real-time pivot. You also need to consider the learning environment, any constraints, the delivery options, and the timeline for the project. The physical space you are working in will also help inform your design. I prefer flexible space but that isn’t always possible. 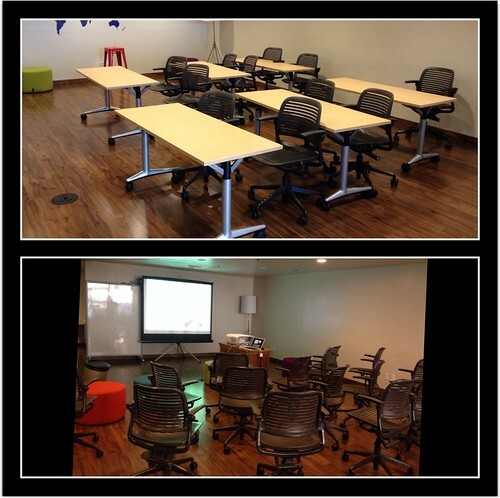 I have learned the feng shui of how classroom setup impacts interaction and learning. For webinars, the platform is your classroom setup, so it important to understand how the Q/A and chat features, whether everyone can see everyone else’s chats or just the presenter. The design is a description of how you will use the time slots – goals, content, instructional activities, materials, technology, documentation, and evaluation. My early experience in doing technology training was collaborating with teachers to deliver professional development on how to integrate technology. I was introduced to lesson planning from veteran teachers and have written “lesson plans” or now that I’m an adjunct professor a syllabus for everything I teach. You may feel at first this is an “extra” step or unnecessary. But, I do this for any training I do – whether alone, with other instructors or even an hour webinar. My starting point for designing is the schedule: the start and end time. I start with a participant agenda and then I do a detailed description, typically with columns that are labeled: time/objective/content/instructional design/documentation. Then I block out 90 minute and 75 minute modules with 15 minute breaks in between. Within the modules, I break it down in 15 minute blocks. I also keep in mind dips in the circadian rhythms for humans that have impact on their ability to pay attention and learn – and I design different types of activities accordingly. As part of the design process, I focus on “real world application” for the material I’m going to cover. Training is only valuable if participants apply what they learn. Training must include time for participants to synthesize what they learned into some ”reporting out and up” takeaways to share with their organization. In my training design, I always include an instructional activity where participants create a “learning artifact” such as a “strategy poster” or filling in a worksheet and allow time in the workshop for participants to present. The content has to be practical about the amount of investment required to implement ideas – and always include some “low hanging fruit” or actionable steps that don’t require a huge amount of organizational change or monetary investment. Your design is not just about content. That’s where a lot of trainers fall short. They focus on the content, not the design of learning activities. Learning activities might include full group discussion, spectragrams, or interactive lectures, sticky note facilitation, small group exercises or games, share pairs, or independent work (reading, working on an assessment, or poster). For many of these, you need materials like sticky notes, markers, paper, pipe cleaner, and maybe even play dough. I always bring a suitcase of supplies, but some spaces come equipped with supplies. I feel strongly that to keep audiences engaged, they have to be moving. As a facilitator, you have to watch the participants body language and look for the “slump,” when they get tired. As I mentioned before, you need to build in shifts in your delivery, whether you get them to stand up and stretch, do a share pair, or move. If you lecture without any interaction for more than 15 minutes, this will no doubt happen. Movement does not distract learners – although some audiences are so formal and stilted they aren’t use to moving and the initial discomfort to asking them to move can make you believe otherwise. When participants move, oxygen to the brain increases, thereby enhancing both learning and memory. People can’t be as focused on content when they been sitting longer than 10-20 minutes. If you are doing a full-day training, you will get the “after lunch” slump. 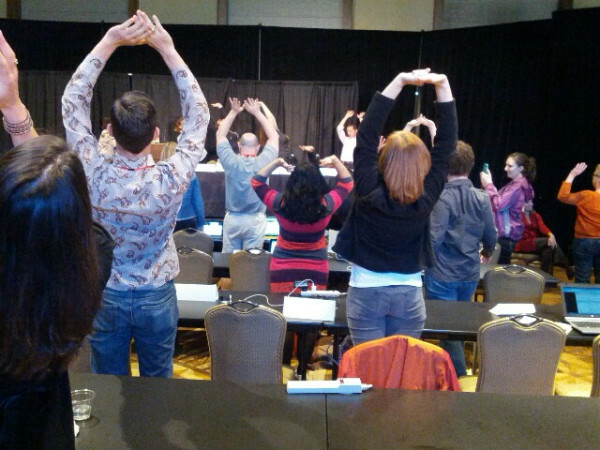 I planned for this by incorporating an after-lunch energizer that used movement to get people’s brains going. Energizers are activities designed to awaken a sleeping audience or activate a jaded one. Energizers are typically done right after lunch and during mid-afternoon breaks, when energy tends to be low, but they can be done any time. The energizer can be connected to the content or just a movement exercise or stretch. You also need to design good openers and closers! Openers can include fun icebreakers that give people a chance to know and trust other people in the group. This helps promote interaction. If you learn in your assessment that people feel a high degree skepticism about the topic or there is resistance, facilitating a “hopes and concerns” discussion about the training can provide the space to let people express that and get it out of the way. This is the research and development of learning materials. This includes: presentations, handouts, and I typically create a wiki or online page for resources. If I am working with a new to me audience, I have to do a lot of research to “localize” or “customize” the content. For example, I recently gave a webinar on social media for engagement of Alumni Networks. All of my examples were from universities, Jewish Day schools, and camps that made up the audience. When I taught Networked Nonprofit workshops for NGOs from India and Pakistan, all the examples and even the icebreakers were relevant. For the development process, I use my lesson plan and do research for examples – I ask colleagues and do internet scans. In topics that I am also a subject matter expert, I draw from content in my books,blog, content curation, or presentations. You can use a “lean start up” approach for the development phase by doing a pilot or experiment and adjust. I do this all the time. This is the actual delivery of the instruction and content. This is where you apply your presentation and facilitation skills. Remember, training isn’t just about content and presenting a monologue. I have a philosophy about training delivery and that is that my audience knows a lot and has an opportunity to learn from each other — if you, as the instructor, don’t talk the whole time! I want the training to be transformative and that happens by being a guide on the side, not the sage on the stage. It is really important to pay attention to body language (discomfort, confusion, boredom, etc.) and be transparent and responsive to the audience. Don’t be so focused on getting through your lesson plan if you feel that participants need understand the content in a different way. The photos above are from a Train the Trainers workshop I did in Tunisia. I asked participants to demonstrate what it looks like being bored vs engaged. If you see your participants looking like the top photo, it is time to shift or do an energizer. It is also important to watch the clock and at the same time be a little organic with your lesson plan if you are running out of time. Sometimes we include too much content, other times an exercise takes longer than we expected or the group just needs to move slower. If you find that you are running behind and have a lot of content left, one trick is to summarize it and let participants now they can access it later. If you are running behind with group exercises, do have everyone do a report out. There will be times when you are presenting content, ideally in short 12-15 modules. 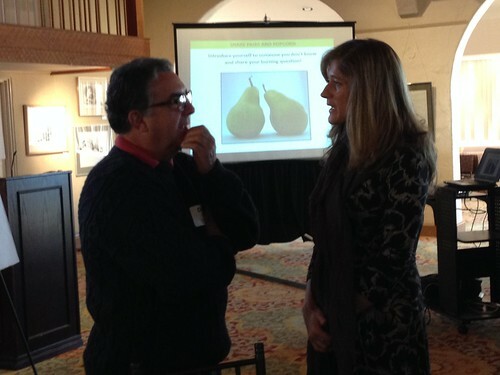 Remember your speaker skills: warmups, breathing, relaxing, physicality, and eye contact. It is critical to understand usual style and consciously mixing it up (if you are usually a “cheerleader”, moderate that energy, etc). the results or effects that the student’s performance has on the nonprofit’s mission. You also want to document your training. My lesson plan includes a process documentation strategy of what and how I will document. I use photo documentation and also social media, for example, tweeting – and do a storify. You can also ask your participants to help with the photo documentation.I write up a documentation strategy as part of lesson plan. Evaluation should also include your personal reflection. This will help you learn to reflect in while you are delivering and adjust in real time. I use the photo documentation, evaluation survey results, review of any assignments, and my lesson plan to reflect on what worked and what didn’t. I write up notes about what to change the next time I deliver the training. This is where I get my best instructional design ideas and how to revise the content so it enhance learning. You have to be a little fearless piloting new instructional techniques or you will just do the same old stuff – you’ll get bored and your participants will also be bored. So writing a lesson plan and using it for reflection is an invaluable process for improving your instructional techniques. If you do training for nonprofits, how do you effectively design your sessions so they get more impact? What are your burning questions about designing and delivering training? Awesome! This is a very rich blog filled with links, tips, examples and design approaches. I will explore this over time. Do you stick to your plan? what guidance or insights can you share. Thank you for your wealth of knowledge and experience. Very instructive and rich “online training course”! I could easily feel your energy throughout the lines. I am myself a trainer and been known to be “no one ever gets bored or sleep in my training” and I could easily feel the same energy with you. It is quite interesting how we learn on the job all those details that you put within this blog and yes, this is the only way for any training to work! The focus, energy, real practice and … the trainer is “the guide on the side” and not the star of the show … it is the participants who truly are. The extra step I would like to include in my “after” is to start using the social media for a lengthier engagement. I usually go back after 8 weeks for a check up (physically or via email) on “how at least one new learned skill or tip was used during those past 8 weeks after the training”. Somehow, the participants, expecting this assignment, are more keen to implement … and I got great results – the best was with one participant doing a total shift in attitude and performance from being almost fired to receiving an encouragement letter! That was amazing and I felt rewarded. Thank you again and I hope we can meet one day! P.S. Very interesting how effectively your site design puts us on a first name basis! One is totally gobsmacked by the depth, breadth and width of your blog. I am a trade teacher in an Australian State Government vocational college training young persons to become State Licensed Electricians. I also teach my passion which is developing people to become workplace training and assessors. Instructional design at what is credentialed as an Australian Qualifications Framework Level Four in Training and Assessment is included but at broad brush level. I will definitely be pointing colleagues and students alike to visit this blog and check out on Slide Share. What is the term “gobsmacked” mean – love it!